Huffman selfies with his fellow sitters. Congressman Jared Huffman is "standing strong," reported his communications director Alexa Schaffer from Washington this morning. 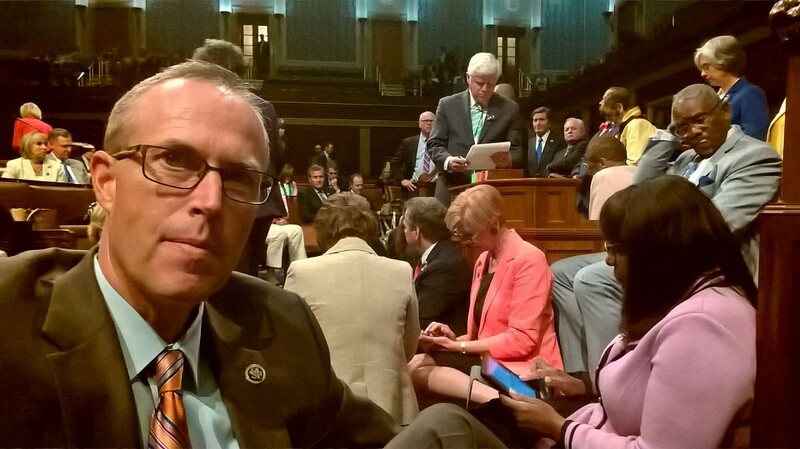 Of course, Huffman is not actually standing, but sitting, on the House chamber floor along with about a dozen other congressional Democrats, to make a point about gun violence. The sit-in commenced yesterday morning, with around 168 House members (out of 188) and 34 senators (out of 44) on the floor and in the aisles by evening. Fortified by doughnuts from Sen. Elizabeth Warren and many boxes of take-out pizza, the protest continued through the night and into today, despite the vote of House Republicans to recess three days early for the Fourth of July holiday. The protest came in the wake of the largest mass shooting in modern American history: 49 people were gunned down in a gay nightclub in Orlando, Florida on Sunday, June 12. The alleged shooter, Omar Mateen, was able to purchase firearms despite having been investigated by the Federal Bureau of Investigation. Four gun control measures, including one that would prevent those having been placed on a terror watch list from buying guns, were rejected by the U.S. Senate on Monday, June 20. Huffman, who joined his colleagues yesterday, wrote on social media that they were demanding an "an immediate vote on common-sense gun control legislation that has been stalled for years in Congress. A moment of silence is an insufficient response to tragedies like Orlando." 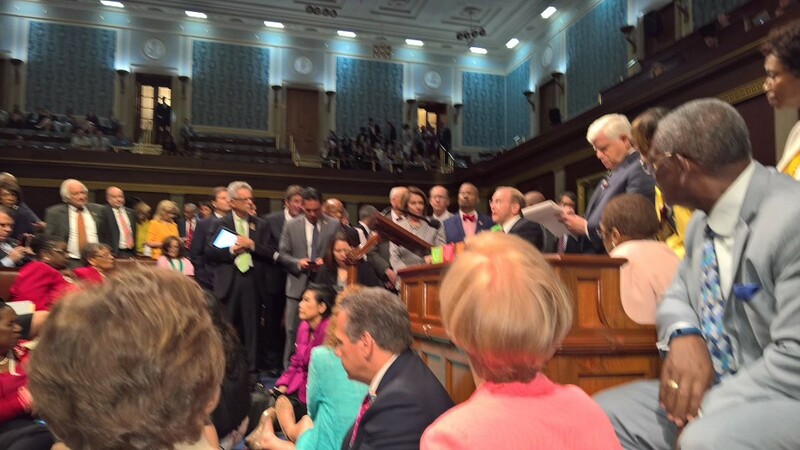 After a vote by House Republicans to cease filming of the proceedings, Democrats continued to document the protest using their phones and social media. Huffman's Twitter feed included some insight into the mood, saying at 4:34 p.m., "We have pizza in the cloakroom to get us through the night. More importantly, we have the courage of our convictions. #NoBillNoBreak." He said that it was his "proudest day as a member of Congress because we are finally standing up and demanding action on one of the most critical issues facing our country." Huffman has been a consistent proponent of gun control, saying that the Second Amendment is "not absolute." In 2015 he co-sponsored Senate Bill 407, the Large Capacity Ammunition Feeding Device Act, which amends the Brady Handgun Violence Prevention Act to restrict transfer and possession of large capacity ammunition. 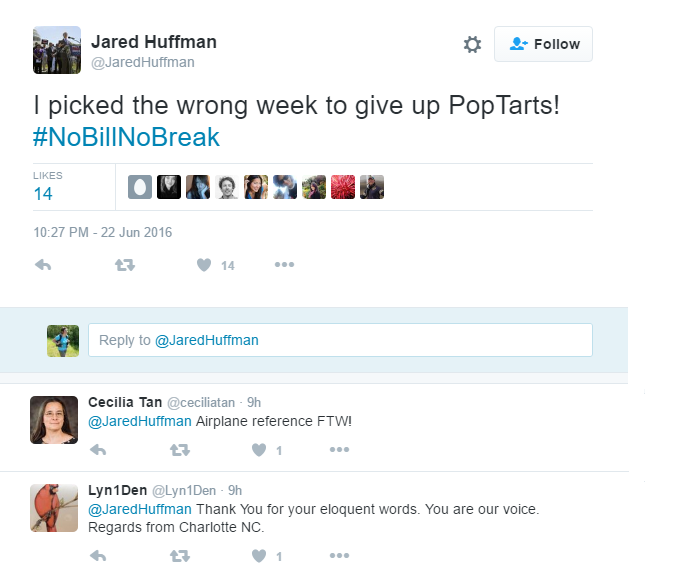 Huffman cracked wise throughout the protest using social media. Huffman spoke twice during the sit-in, once on the issue of gun violence and again on the presence of Confederate battle flags in national veterans cemeteries. A provision banning the flags, which Huffman led earlier this year was reversed by House Republicans at 3:10 a.m. Via Twitter Huffman fumed that they had "found the time" to make this decision, despite refusing to vote on a gun bill. Washington, D.C.- In the dead of night while civil rights icon Rep. John Lewis (D-GA) led Congressional Democrats in righteous protest to call for a vote on gun safety, Congressional Republicans added insult to injury by quickly reversing an earlier vote on a provision by Rep. Jared Huffman (D-CA), Rep. Ruben Gallego (D-AZ), and Rep. Keith Ellison (D-MN) to remove Confederate flag displays from national veterans cemeteries. At 3:10 am, without allowing any debate, the Republican House majority approved a partisan conference report that had been filed only hours before, which omitted the Huffman-Gallego-Ellison amendment despite its earlier House approval. “Amidst a historic protest to demand action on the nation’s gun violence epidemic, in the wake of the largest mass shooting in our nation’s history, we are seeing the real priorities of the Republican majority; they have refused to allow any votes on gun safety, but did find the time to try bring back the racist symbol of the Confederacy. It is shameful that Republicans would once again seek to allow Confederate battle flags, a historic symbol of hate, to be flown over VA cemeteries. Republicans are showing where their allegiance lies — and it is not with the victims of gun violence,” said Rep. Huffman. 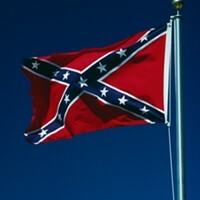 Just last month, the House of Representatives passed the Huffman-Gallego-Ellison amendment to the 2017 VA funding bill, to prohibit federal taxpayer funds from being used to fly the Confederate battle flag at cemeteries operated by the Department of Veterans Affairs. The VA currently permits the display of the Confederate flag on Memorial Day as well as on Confederate Memorial Day at 131 facilities. A view from the floor of the House.